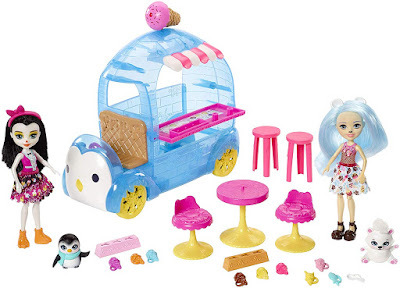 Head over to get this Enchantimals Frozen Treats Truck + Preena Penguin Doll and Jayla Figure for ONLY $7.80 (Retail $34.99)! Roll into frozen fun with this Enchantimals igloo ice cream truck! Preena Penguin doll and Jayla penguin love serving frozen treats to their new friends, Pawbry Polar Bear and Melt polar bear (found exclusively in this playset). The translucent, igloo-inspired truck is so cool with "icy" brick details and bright yellow wheels. To show off its frozen treats, the vehicle is decorated with an ice cream cone on the roof and a sign on the side (that flips down to become a pink counter)! Preena Penguin doll and Jayla penguin can "drive" the ice cream truck around. Simply place them behind the wheel and push to get the fun started! The two best friends can then "stand" behind the counter to serve chilly treats to all their forest friends. Choose from so many different "flavored" ice cream cones that can really be held by doll hands! There's plenty of seating for the Enchantimals dolls to enjoy their desserts…take a seat on the two counter stools or at the table. These 6-inch Enchantimals dolls are wearing sweet outfits decorated with ice cream, sprinkles, and popsicle prints. They have adorable details to match their animal besties, showing their special Enchantimals bond -- like adorable penguin feet shoes on Preena Penguin and polar bear ears on Pawbry Polar Bear doll.